If you want to lose weight and increase your metabolism, one of the most important things you can do is weight training. Your nutritional diet and cardio training is important as well, but when it comes to changing how your body looks and feels, weight training (also known as strength training) will win every time. Helps increase your metabolism. (muscle will burn more calories than fat, so the more muscle you have the more calories you will burn). Increases the ability of the core muscles to stabilize the pelvis and spine under more pressure. Improves your muscle size and endurance by increasing the strength of the muscles, ligaments, tendons, and joints. Increases bone mineral density and strengthens bones (especially important for women). Helps improve balance and coordination, helping you avoid injuries. Increases your self-esteem and confidence. 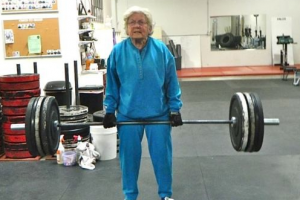 Many people will say as they get older they can’t workout, or they don’t have time. Then they pay the price by losing strength and muscle mass that is necessary for daily functioning, which then leads to an increase in injuries. Have you ever heard of the saying, “if you don’t use it, you lose it”? Well, this holds true in this case, if you fail to keep up your strength, especially as you get older, you will have difficulties with simple everyday tasks that you use to be able to do with ease and possibly injure yourself. Yes, the older gal you see to the left is lifting a lot of weights, and you can too. So learn the benefits of working with free weights from a skilled Certified Personal Trainer. Tracy Rewerts at Time For Change Personal Training, LLC can help you benefit from a weight training program to help you prevent an injury from occurring or to start healing from an injury from the past. No matter what your age, there’s a need for strength training and I can help you determine the frequency, number of reps, and the amount of weight to lift during your workouts depending on your personal goals. The most familiar myth about weight training (especially for women) is that lifting weights will make my muscles too big. Lighter weights with fast repetitions will yield nice toned muscles, rather than large muscle bulk. If bulk is what you’re looking for, I can adjust for that as well. Be sure to always warm up before you start your workout or weight lifting to prevent injuries. Don’t hold your breath while performing exercises. Be sure to breath correctly by exhaling forcefully through your mouth during the hardest part of the exercise and Inhaling through the easiest part. Use the full range of motion throughout the movement you’re performing. Don’t rush through your weight lifting motions. Lift and lower your weights slowly by resisting in each direction. Watch your posture and be sure not to “cheat” by using the momentum to lift the weight. (this means you’re trying to compensate and you’re using too heavy of weights). Always tighten your core by engaging your abdominal muscles during every movement. Want to get started on a weight training program today? Click on the contact tab above to get in touch with me or go Time For Change Personal Training Services to see what we offer. It’s Time For Change….What are you waiting for?